Grief is shovelling snow in Kenneth Lonergan’s highly-anticipated third film Manchester by the Sea. The taciturn Lee (Casey Affleck) literally does it by day as the handyman for a Boston apartment building, and figuratively does it by night as he drinks himself into bar fights. His shoulders bow beneath the weight of some past misfortune and his recalcitrance seems to be his defining character trait. When a death in the family forces him to return to the eponymous hometown, it allows for a beautifully nuanced examination of how tragedy fundamentally alters us and the way we engage with the world. Lonergan’s drama is minor-key. The slate-coloured waters and stony cool of winter in Essex County, Massachusetts seem to be a continuation of Lee’s unshakable misery and Jody Lee Lipes’ empathetic camera is as important in projecting Lee’s emotional state as Affleck’s brilliant and subdued performance. 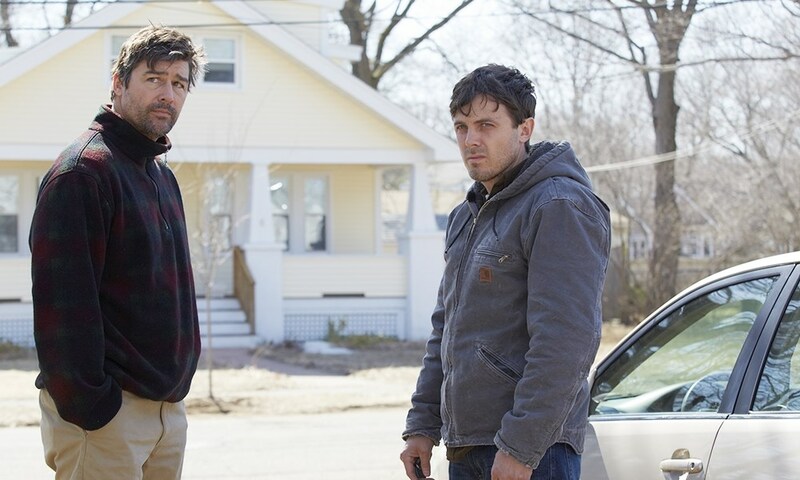 The not-unexpected passing of Lee’s brother Joe (Kyle Chandler) forces him to travel back to Manchester-by-the-Sea to take care of arrangements and his sixteen-year-old nephew, Patrick (Lucas Hedges). With echoes of The Sweet Hereafter, the community Lee left behind is still raw with the memory of what happened – which is itself gradually revealed through a series of flashbacks. They do offer a counterpoint to Affleck’s inability to communicate, showing Lee as a more gregarious husband, father, brother and uncle. There’s gallows humour to the scene in which Joe learns of a dangerous heart defect, his distraught wife furious that they can be joking at a time like this. The humour is consistent through the film, the result of abrasive personalities rubbing up against each other with Lee playing bemused straight man to his cocky lothario nephew. Comedy is used to undercut the most horribly tragic of moments – a phone vibrating on the pew at Joe’s funeral, two paramedics unable to get a stretcher into the back of their ambulance – given the sadness all the more pathos and offering glimpses of hope in a narrative resistant to catharsis. Lee’s ex-wife Randi (Michelle Williams) still lives in town and the two share a couple of wonderful scenes that will bring tears to the eyes but refuse to purge the pain in their awkward inarticulation. “My heart was broken, it’s always gonna be broken and I know yours is broken too,” says Randi, but it’s not enough to crack through the ice that Lee just can’t shake. It’s a bold decision by Lonergan not to lead Manchester by the Sea towards the conventional conclusion, but one that’s authentic. A conversation can’t always give salvation, even when that’s what is being offered, but there are ways to live alongside our ghosts rather than behind them. Ideally with a dose of mordant humour and a large shovel. The Toronto Film Festival takes place from 8-18 September. For our coverage follow this link.